KUALA LUMPUR 14 NOVEMBER 2018– FGV Holdings Berhad (FGV) has signed a memorandum of understanding (MoU) with the Dalian Commodity Exchange (DCE) to collaborate in the implementation of DCE’s Palm Oil Internationalization Project. The DCE, the world’s largest agriculture, plastics, coal, iron ore futures bourse, aims to increase cooperation with palm oil companies in the Belt and Road countries, to expand palm oil futures delivery regionally. The MoU focuses on services offered by Felda Johor Bulkers Sdn. Bhd (FJB), a subsidiary of FGV. Furthermore, FGV is also required to provide support for DCE’s research in the palm oil futures and spot markets in Malaysia and Indonesia, as well as promote bilateral cooperation between the two parties. The collaboration will potentially contribute an estimated RM 1.5 million in revenue, with profitability of RM 525,000 per month, based on throughput projection of 50,000 MT. FJB has extensive experience in the bulking business with over 860,000 MT of total liquid storage capacity across its terminals in Malaysia, Indonesia and Pakistan. FGV has the world’s largest bulking and storage facilities for vegetable oil. The DCE has a total of 16 futures contracts listed for trading that includes a variety of agricultural and industrial produce. As at the end of 2017, DCE had 165-member firms and 3.09 million investor accounts, including 89,300 corporate accounts. DCE had 280 designated delivery warehouses and 14 margin depository banks. “I am confident that with this collaboration, FGV will be able to work with DCE to grow beyond China and to support its plans to accelerate the process of delivering physical palm oil to buyers,” said FGV Chairman, Datuk Wira Azhar Abdul Hamid. 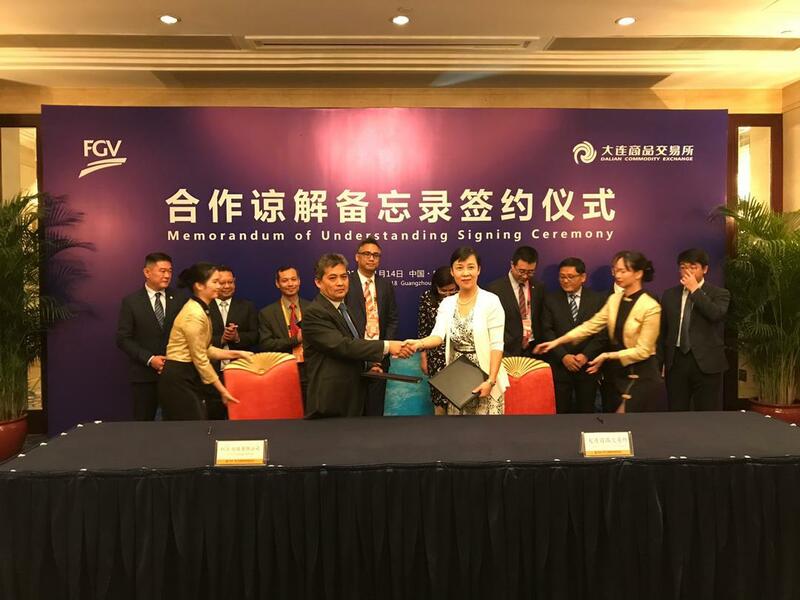 Through FGV’s subsidiary, FGV China Oils Ltd (FGVCO), this collaboration is also set to be a catalyst to unlock more potential collaborations in other related industries in China, and B2B ventures, to expand its palm-based business operations in the region. FGVCO is based in Dongguan City and is involved in the operation of palm oil refineries, edible oil storage and trading, and the production and sales of palm oil, palm-industry related products. FGVCO can compete in the China market as it has a reliable supply of palm oil and its derivatives from the FGV Group, licenses for the handling of all types of oils including soybean, rapeseed and in-house research & development capabilities to provide technical and product innovation. Meanwhile, Zhu Lihong, Executive Vice President of Dalian Commodity Exchange (DCE), said that as the first to introduce the commodity options in mainland China, DCE has also taken the lead to launch the internationalisation of a domestic mature futures product. Successfully transforming from a single and closed commodity futures exchange to a diversified, open and comprehensive derivatives exchange, DCE has started a new journey of building itself into a world-class derivatives exchange and a global commodity pricing center and risk management center. Going forward, DCE will seize the valuable opportunities brought by the “Belt and Road” initiative, learn from the mature experience in internationalization of the iron ore futures and further push forward the internationalization of the futures products such as palm oil with the strong support of FGV and other market participants. DCE will strive to provide the international market with more open, transparent and fair prices, and offer effective hedging tools to the countries and regions along the “Belt and Road” to enable the oils and oilseeds industries to jointly enjoy the dividends of China’s reform and opening up through the interconnection and integration of the futures and spot markets across the world.